You can start with five choices of food at the bottom, which is a 'healthy food' and 'good nutrition' to eat while maintaining lean body proportions. If you are looking for the day snack, chew only a handful of almonds. According to a 2009 study published in The American Journal of Clinical Nutrition, found that women who ate almonds at least two times a week maintain weight loss more successful than those who do not eat. Furthermore, only 1 ounce of almonds contains 167 calories, 6 g protein, 3 g fiber and that makes you feel full longer. Of the many vegetables that can help you stay slim, tomatoes can be an excellent choice because it tastes so delicious. A red tomato contains only 43 calories, but it remains equally delicious with a high-calorie foods. And tomatoes will also help keep your waist size. Apples are an excellent source of fiber. Fiber not only the digestive system and reduce cholesterol, but also did not contribute many calories while maintaining a sense of satiety. 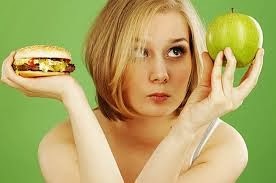 In one study, noted that women who ate three apples or pears a day lose weight easier. Seafood can indeed be part of a healthy diet. Moreover, there is some evidence that the fats in foods like salmon can increase the level of satiety. A study published in the International Journal of Obesity found that people who eat salmon several times a week, losing about 2 pounds more weight than those who do not eat seafood hobby. beside it, salmon is also a good source of protein. There is no doubt that the protein, such as fiber, can make us full longer. Although egg avoided by some people, but actually the eggs are also good for maintaining weight loss. Research shows that eating eggs for breakfast can help you fight weight gain throughout the day. A study reported in 2008 in the International Journal of Obesity found that eating two eggs for breakfast five days a week will make you lose weight 65 percent more than those who eat bread in the morning. Some scientists suspect that eating eggs in the morning can make us feel more full throughout the day.